Yazidis traditional group performs during the commemoration of the third anniversary of what the United Nations said was a genocide, in Duhok, Iraq, Aug. 3, 2017. Members of the Yazidi religious community in Iraq and around the world commemorated the third anniversary Thursday of the massacre of thousands of civilians in their historic homeland, Sinjar, at the hands of Islamic State group militants. Amid expressions of grief and calls for action by the international community, Yazidi officials said the tragedy their minority group suffered in Iraq in 2014 continues: Thousands who disappeared while IS extremists were in control are still missing, and large numbers of other Yazidis who fled for their lives have not been able to return. Yazidis, an ethno-religious minority group of about 550,000 people, mostly reside in northern Iraq, in an area also populated by Kurds and Arabs. The extreme and rigid version of Islam that Islamic State professes regards the Yazidis as “devil worshippers” who must either renounce their religious views or die. Yazidism is linked to ancient Mesopotamian religions and combines aspects of Zoroastrianism, Islam, Christianity and Judaism. As an ethno-religious group, most Yazidis marry only within their community; those who do not are considered to be Yazidis no longer. According to international organizations, IS was responsible for the killing and abduction of roughly 9,900 Yazidis and destroying 68 Yazidi shrines in 2014. When the terror group entered the Yazidi ancestral city of Sinjar, Aug. 3, 2014, they murdered roughly 5,000 men and boys and enslaved thousands of women and children. Those who managed to escape were trapped on Sinjar Mountain, leading to an international outcry and response, including U.S. airstrikes. 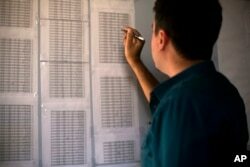 Bahzad Farhan Murad points to a list of missing and killed Yazidis to The Associated Press in the small office where he collects evidence on Islamic State crimes against Yazidis, in Dohuk, Iraq, May 22, 2016. The United States, United Nations, European Union, Canada and other countries maintain that Islamic State’s all-out assault against Yazidis amounted to genocide. Those who represent the religious minority say that recognition is welcome, but more action is necessary to rescue the Yazidis whose lives are still controlled by Islamic State. “We have managed to rescue 3,054 people, but 3,360 people are still under IS,” Dakhil, the Yazidi member of Iraq’s parliament, said during an appearance this week at the United States Institute of Peace in Washington. She said more than a thousand Yazidi children, ages 4 to 10, have been brainwashed and trained by IS to conduct suicide attacks. “Those children now have forgotten their names, language, and parents. They have been trained to kill Yazidis and Christians,” Dakhil added. Displaced Iraqis from the Yazidi community gather at a park near the Turkey-Iraq border at the Ibrahim al-Khalil crossing, as they try to cross to Turkey on Aug. 15, 2014. Dakhil appealed to the international community to help those who fled, to assist them in returning to their homes or resettling again in the Yazidi community. According to Yazidi organizations and advocates, about 400,000 displaced Yazidis are living in refugee camps in Iraq’s Kurdistan region, and another 90,000 have emigrated to Europe and the United States. 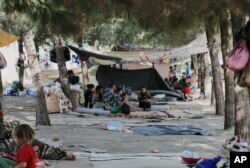 Those who reside in refugee camps complain about harsh living conditions and a lack of basic services. “We have been placed in those refugee camps without clean water or other basic services,” Kachal Jardo, a displaced Yazidi from Sinjar who lives in a camp north of Nineveh Plains, told VOA. Jardo contends Iraqi officials have failed to protect 43 mass graves that hold the remains of Yazidis executed by IS. And Yazidis have not been allowed to exhume the remains for reburial, he said. “Those mass graves are abandoned and no one knows what is going to happen to them. Only God and foreign countries can come to help us find our missing people and bring them home,” Jardo said. Iraqi Kurdish officials estimate the mass graves hold the bodies of hundreds of Yazidis massacred by Islamic State fighters. U.S.-backed Kurdish forces known as the Peshmerga removed IS from Sinjar in November 2015. But more than 80 percent of the city’s buildings and infrastructure are in ruins. Yazidi officials said residents have not been able to return, mainly because of disputes among anti-IS groups over control of Sinjar. 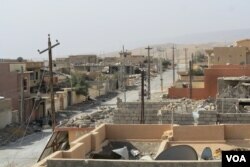 Experts say efforts to rebuild Sinjar and bring it back to life also should address issues such as who will govern the area and what will happen to its Arab population. Yazidis claim Sinjar’s Arabs cooperated with IS and served as guides for the extremists during their bloody massacre. “Sinjar could be a flashpoint for an internationalized tension ... where you have the sensitivities between minorities themselves, and you have regional countries like Turkey and Iran who have a stake in this,” said Sarhang Hamasaeed, an Iraqi expert at the U.S. Institute of Peace. Restoring security to Sinjar and other territories in the post-IS era, Hamasaeed said, will ultimately depend on local communities’ reconciliation. Vian Dakhil of the Iraqi parliament said she recognizes the importance of reconciliation between Yazidis and other Iraqi groups, but such a task could be difficult and time consuming. “How can I tell someone in my community who lost 68 people of his relatives to come back and trust the neighbor who reported him to IS?” Dakhil asked.